It's that time of year folks! It's time for my Christ-Centered Easter Basket Series. This year's colors are pink/purple and blue/green as the result of my poll. As I mentioned last week, I am bringing back a few different items from last year in the new color schemes. Of course, NoBunny has to be one of them! I have almost finished The Kiddo's basket, and am so excited to use each little item as a teaching tool to help my child learn about the true meaning of Easter and God's Perfect Gift on the cross. My topper is sized 7 inches wide, but you can leave more trim or shave off the sides to accommodate different bag sizes. 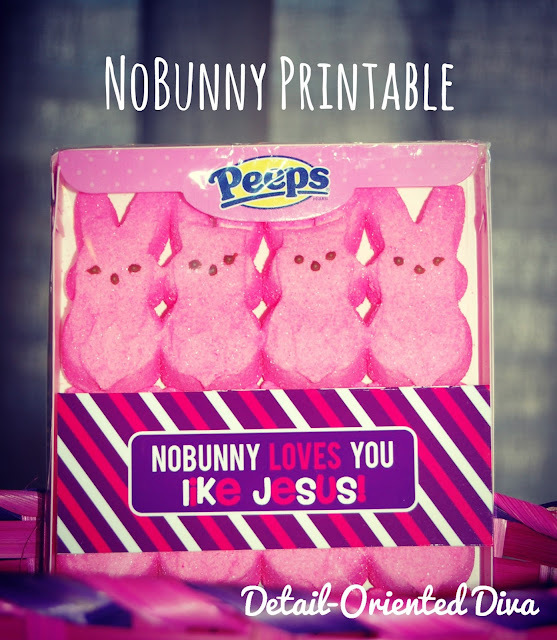 Just print off the printable (there are two per sheet) and fold over ziploc bag and staple on sides. I just trimmed mine to fit onto a package, since I didn't want them to get stale and me to get all sticky! Printable links for blog-subscribers are under each picture. Personal-use only, please. Please do not ask for any other color variations or special requests. These are the colors that you selected. Thank you so much for the download. The colors are great. Have a great day.